A head teacher at a Manchester girls' high school has been suspended after a snap Ofsted inspection found bullying and a "rapid" drop in behaviour. Amanda Thain has been removed from her post at Levenshulme High School for Girls, which has been placed in special measures. Inspectors found a core of girls running riot with fighting, swearing, smoking and truancy going unchecked. 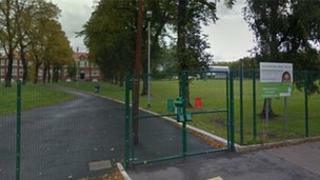 Last October, Ofsted said Levenshulme was a "good school". The latest report followed an unannounced inspection in July. It said many pupils feel "unsafe" and "have little confidence" in the ability of teachers to deal with unacceptable behaviour. There had been eight exclusions in the past year. The report said teaching was frequently "not good enough" with underachievement particularly marked in white British girls, disabled students and those with special educational needs. Patsy Kane has been brought in as executive head teacher from Whalley Range Girls High School in Manchester, which has an "excellent" safeguarding record. The two schools will work closely together. Ms Kane said: "From day one of the new school year nobody will be in any doubt about the standards of behaviour which are expected from them. "They will also know who to speak to if they do have any concerns and can be reassured that these will be dealt with appropriately." John Edwards, the director of education at Manchester City Council, said: "We recognise the seriousness of the concerns raised in this report and, together with the school, have taken swift and decisive measures to address them." The latest inspection also noted "pockets of high quality teaching" especially in ICT, science, performing arts and geography. It also described some performing arts classes as "inspirational".